There are several ways to customize the Raptor, whether you opt for a different color or pick the sport package with fog lamps and a new headlamp design. There are also options for an extended cab and cargo bed if you want to increase the size of the Raptor. In addition, the engine gets up to 450 horsepower thanks to twin turbo construction. The racing features are also a nice surprise when you want to accelerate or maneuver around tough terrain. 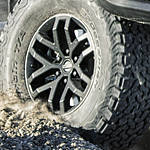 This includes the FOX Racing Shox and BF Goodrich all-terrain tire package. Want to see what it’s like to drive a Raptor? You can stop by Baytown Ford to see what’s available and take a test drive.